He was right. Profitability is essential to the health of any business and necessary to enable the business to continue to grow and provide jobs for its employees and service to its clients. But whoever said “you have to spend money to make money” was also right. And yet, protection of profits is cited as a barrier to the upfront investment needed for initiatives like client experience (CX), even though they promise long-term growth and profitability. How can you help your team (and possibly your leadership) see the long-term ROI of placing the client at the center of everything your firm does? We’ll talk about how and what to measure in the next step. For now, let’s agree that if you want to measure the impact of a shift such as this, you first need a solid understanding of when you believe your clients will notice a change. Journey Mapping lets your team map out the interactions your client has with your firm throughout your entire relationship. This includes the moment they are introduced to you through a business opportunity, a meeting, or networking event until the project is completed or service provided is finalized and you are continuing to build the relationship in the hope of repeat business. To complete your Journey Map, you and your team want to consider who is involved (both on your team and the clients’), what is exchanged during points of interaction (reports, deliverables, emails, invoices, etc. ), what goes on behind the scene for both you and your client, and the many possible emotions your client might have during each of these moments. This process allows you to pinpoint moments of elation, friction, and even indifference, which then provides areas of opportunity as you look for ways to do more of what delights your clients and discuss ways to remove the friction and/or indifference in the relationship. Targeting feedback requests (measurement) around these moments and reviewing trends over time will allow you measure and prove how your culture shift is affecting your client relationships. Let’s talk about how and what to measure so you can identify meaningful trends linked to your firm’s investment in client experience. Client Savvy provides their clients with an electronic feedback tool created using insights from more than a decade of research into best practices. I will be using our feedback tool as a reference, however the strategies I’ll share can likely be incorporated into whatever process you are using. As I mentioned earlier, you want to ask for feedback following those moments in which you have changed your process based on your journey map results. But before you even do that, you need to understand what your clients are actually saying before you make any adjustments. At Client Savvy, we call this a “baseline.” The results you bring to your leadership showing positive improvement will have much greater impact if you can demonstrate quantitatively where you started. ACME Engineering identified several opportunities in their existing process and made changes they felt would enhance their clients’ relationship working with them. Two of these were their invoicing process and communication strategies. In both cases, looking at how their clients might feel and questions they might be asking led to these changes. On their invoicing process, the change was simple. Right before the first official invoice was sent to their client on a project, they sent a sample invoice. They explained the invoice layout and information provided and asked the client if this invoice format would work for their needs. They did this with every project regardless of whether they had worked with the client representative before or not. They felt it was important to ensure that nothing in that individual’s preferences had changed. The change in their communication strategy was equally simple. They used their insight into what their clients might be thinking or feeling during the construction phase of the project to adjust their interaction with them. ACME team members realized that often during construction, their team would just ‘handle’ challenges in the client’s best interest. They had used the lens, ‘we are the experts and they hired us to handle challenges.’ But the Journey Map helped them see that although their clients trust them, they like to understand what is going on and be part of the solution. This led them to include as part of their service delivery process an internal review of potential construction challenges followed (if needed) with a client meeting to discuss and share these findings. ACME had already been getting feedback on both their invoicing and communication interactions, so a baseline was not needed. As they implemented these changes, it was easy to see the impact they had on their clients’ perceptions of the experience of working with ACME. You’ll see that some measurements are around human facing activities and others are based on actual deliverables. Both categories are integral to a complete client experience. 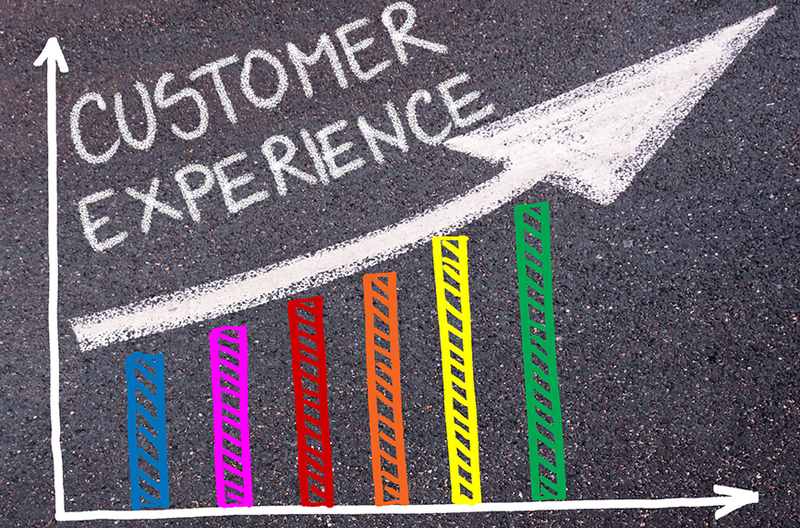 And while there will be nuances to your client experience process for each of your clients, using the measurement criteria above for your entire client portfolio will allow you to identify trends and gather data that supports your decision to place clients at the center of your business by delivering the best CX you can. As important as they are, numbers tell only part of the story. Qualitative data (such as a linguistic analysis) often gets a bad rap. We often mistake its lack of “hard” numbers and stark facts for imprecision. But it’s our tendency to treat qualitative data the way we treat quantitative data that creates the problem, not the data itself. Doing that to qualitative data is like blaming a hard-boiled egg for ruining the cake you’re baking. Hard-boiled eggs have many uses – baking just isn’t one of them. In a recent post, Kate Lucey shared a case study taking us ‘behind the scores.’ The case study focused on a client whose quantitative scores were all over the map and who, simultaneously provided extensive comments at every opportunity. Looking at the numbers alone was confusing. After analyzing their comments, however, Kate gave the firm a clear picture of what was going on with their client. As she presented the results, she could see the lightbulb moments for members of the team. It all made sense AND it gave that firm an opportunity to make changes that affected their clients’ experience going forward. One “aha” moment for one client can quickly turn into a change for all of them, which you can then assess for success with subsequent feedback. Speaking of success – never forget that firms don’t implement CX strategies, their employees do. Ensure your team understands the value of their buy-in to your firm’s focus on client experience. Let them feel the impact they had on the positive return on investment you are seeing. Don’t be afraid to let them feel proud of their contributions to what you’ve achieved. After all, staff who feel confident and competent in their work tend to stick around. Your ability to retain your staff has direct impact to your clients’ experience working with you. While it can cost $100K+ to replace an employee, the impact to your client relationships can make this number much higher. Here are three tips to celebrate your team’s success. Ensure your team understands how their work enabled success. We all like to hear “Great job” but your feedback to your team is more valuable when you identify the specific actions they took to create positive results. Many firms are now going away from annual reviews to a more ongoing review process. Regardless of which your firm uses, encourage your managers to keep a file on their phones or laptop where they can note what members of the team have done. Then, remind them to share these results with the larger team. It’s great to think that all team members will embrace the changes your firm is implementing equally. The reality, however, is usually different. Challenge those members of your team that really embrace your CX initiatives to become more involved. Can they be part of a team that brainstorms ways to increase engagement? Can they be part of the analysis of the data and help your firm identify the trends you are seeking? A quick conversation and some guidance might produce a win-win-win for your CX program. Your employees are on the front lines and are, at times, the ones closest to your clients. They speak with them regularly and have a different relationship with them than your firm’s leadership. Take advantage of the reality that they have their finger on the pulse of the relationship and give them regular opportunities to share what they have heard. Reflecting together, they might uncover more than they anticipated, which means growth for all. Client Experience (CX) is proven to drive firm growth and profitability. Convincing your leadership to invest in CX as an initiative doesn’t have to be a hard sell. Using some of the simple steps I’ve outlined here can start you on identifying, measuring, and celebrating the successes you are creating. And remember ACME Engineering? Below are the results they have experienced as a function of the initiatives they put in place. Let us help you move your client experience strategy to the next level. There are many ways we work with our client firms. Call us at 1.866.433.7322 to see what might be the next step that is right for you.